To help create strong, healthy, functioning schools, workplaces and communities, through building, enhancing and restoring relationships. The very heartbeat of our homes, schools, communities and workplaces are the relationships within them. For foundations to be strong, significant building blocks must be put firmly in place. Openness and care are essential for relationships to be enhanced and strengthened; when there are breaks and harm done to relationships, restoration can be achieved through involvement, dialogue and consideration for and by all involved. Restorativeschools.org seeks to support and grow these relationships and in doing so weave strong threads into the fabric of our communities. 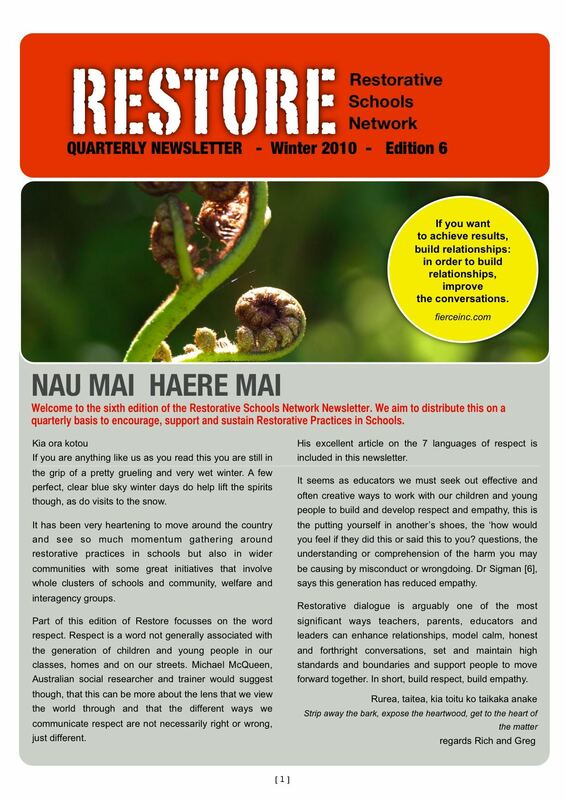 Restorativeschools.org has been operating since 2007 supporting restorative practitioners working in schools and across the community. This site provides information on training opportunities and workshops, current research papers and relevant readings, restorative resources, conference information, professional development opportunities and connections to the Restorative Network that will help support the development of restorative practices locally, nationally and internationally. Visit the training hub for more details! "A fantastic workshop, facilitators catered for the needs of the participants effortlessly. Interactive, interesting and well paced, some of the best professional development I have had in years. Thanks!